Now, 34 visitors are online. 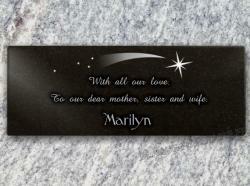 Glass marker to put on a grave in a burial ground. 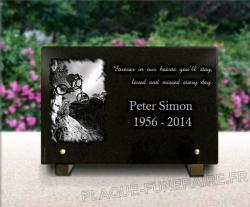 An outdoors memorial plaque to put on a tomb. 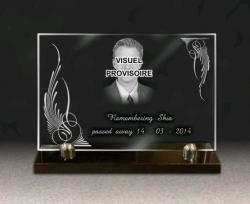 A burglarproof glass burial plaque with engraving. A decorative frame. Engraved text to the deceased. As Renaud Gravure's plaque are customisable, you are free to write the text you want. Some people just write the deceased's dates of birth and death, other people prefer writting a poem, a letter to the late person. There exist websites with example of headstone thoughts. It is possible to write them on the plaque, with the front you like. Moreover, there are some examples in the software of creation of plaques. The glass used for this plaque is perfecttly studied to be outdoors, as it is resistent to froist and heat. 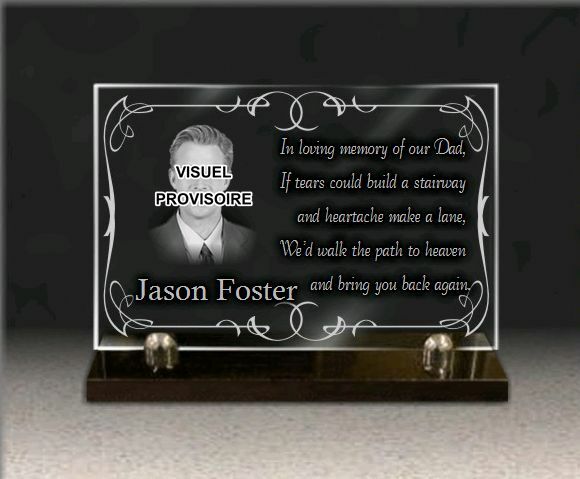 The fact is that we know a burial plaque can be an investment, we do not want you to have to buy another one in few time. Thus we only sell high quality products. Price calculated in real time for each personalisation. Secure payment : Visa, MasterCard, AmericanExpress, PayPal. Delivery to United Kingdoms, Ireland. Worldwide : Reduced price. It is a transparent burglarproof glass plaque. It stands on a black granite base. It is maintain with two metal feet. The plaque has an engraved decorative frame. It is not straight but original. Inside the frame the plaque is divided. At the left there is a big portrait. It is the deceased portrait the customer upload. Below there are names quiet big, Jason Foster. On the right, there is a text. This is a special burial thought. " In loving memory of our Dad, If tears could build a stairway and heartache make a lane, We'd walk the path to heaven and bring you back again". This message is five lines long and written in italics. The frame is part of the plaque, thus it will appear with the plaque. Please go on the configurator thanks to the button on the left on the page. - The plaque : "Plates", " Burglarproof glass plates". 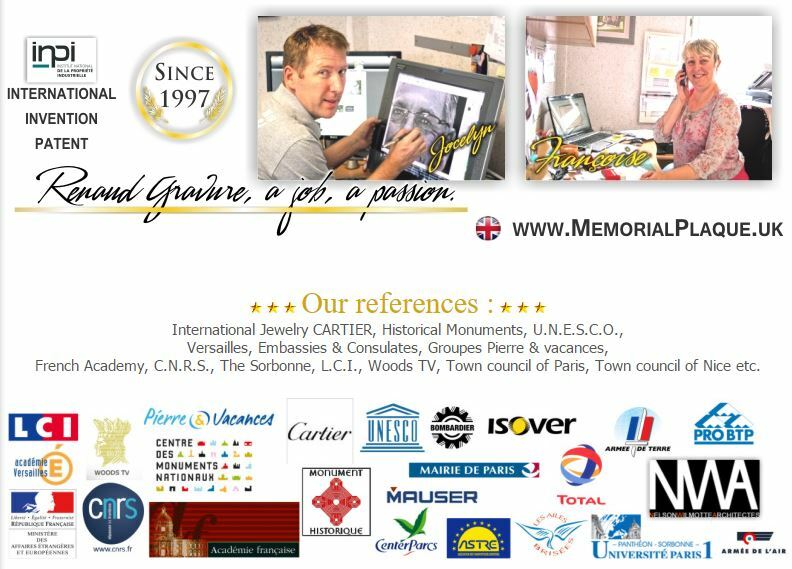 A small page opens and here click on "Plaques glass on granite socle". A menu appears and here click on "Plaques ornam borders"; go down to find the model. - The portrait : As said before, it is the deceased portrait you will have to upload. Our artist will work and draw on it, thus it will not be the final result. Moreover, if you do not have the photo on your computer, it is not a problem you can send it to us. Click on "Photos, engraved portaits". 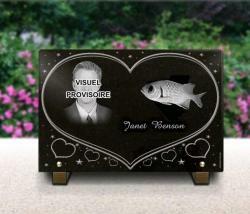 "Create engraved photo 1". Follow the instructions according to your text. At the end of the order, feel free to ask for some modifications. - The texts : There are two texts : names and thought. Names : "Texts", "Create text #1". Write it with your keyboard, change the font with the thumbnail "2: Letters' shape" and choose "Style 10"
Thought : "Texts", "Create text #2". Here the font is "style 2".